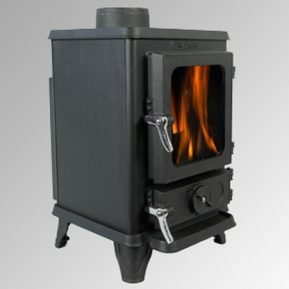 The new small wood cook stove from Salamander stoves. 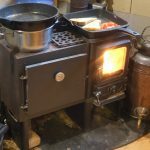 After building a prototype small cook stove oven version of our tiny wood stove for trialing, we have spent the last 18 months carefully designing what we think is the best small wood cook stove you can find. 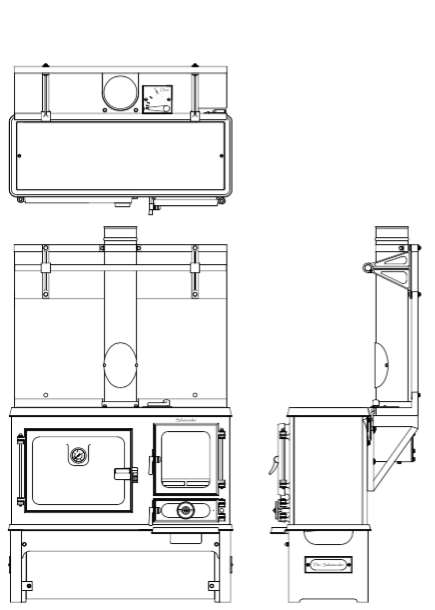 Building into our design all of the design features of larger solid fuel ranges but in a perfectly formed smaller, compact package. Like a mini Aga, or a tiny Rayburn, ours is a solid fuel cooking range that has been shrunk down into a ‘hobbit sized’ package. 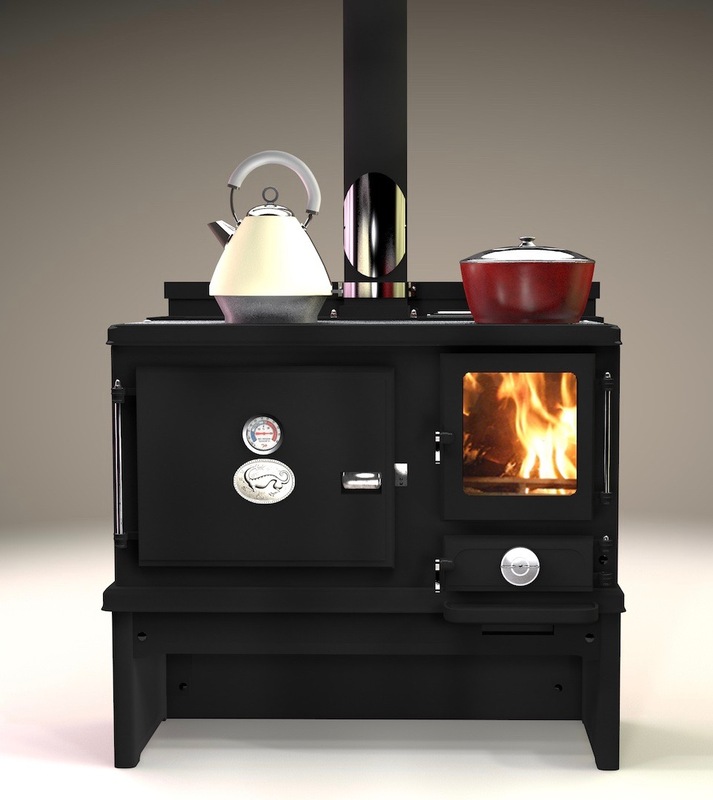 Taking inspiration from the vast heritage of both UK and US vintage antique cookstoves of the past and bringing this together with the need for modern clean burning, in an attempt to produce an efficient cook stove with charm and character. Rather than installing an ordinary stove in your fireplace you could have a little wood cook stove and turn the space into a tiny kitchen. 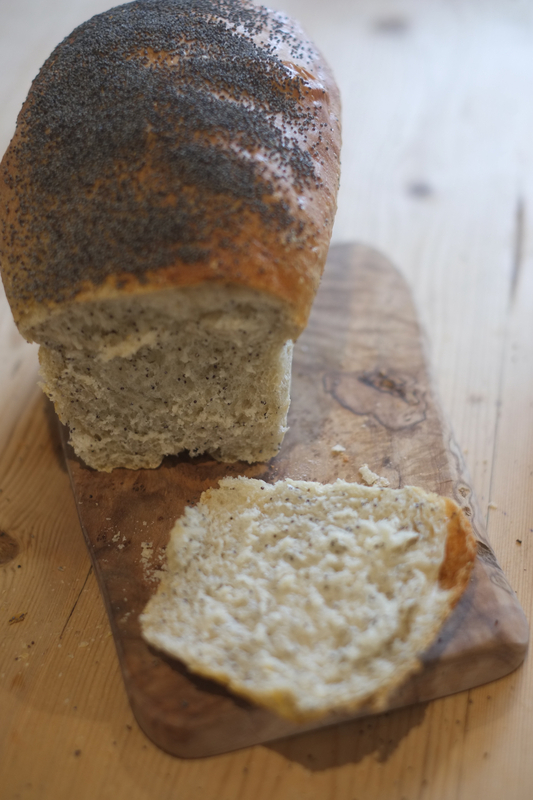 Keeping warm and cooking up a storm you will be living the ‘good life’ beside your little range. 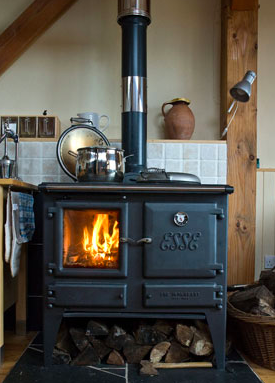 The cook stoves with top ovens are not really great at cooking anything despite their title which is why cookstoves and ranges like the Aga, Rayburn and subsequently the Esse Iron heart wood burning range (picture below) have become successful and well loved focal points of countless homes. They are however large objects so cannot always find a home in the small spaces. 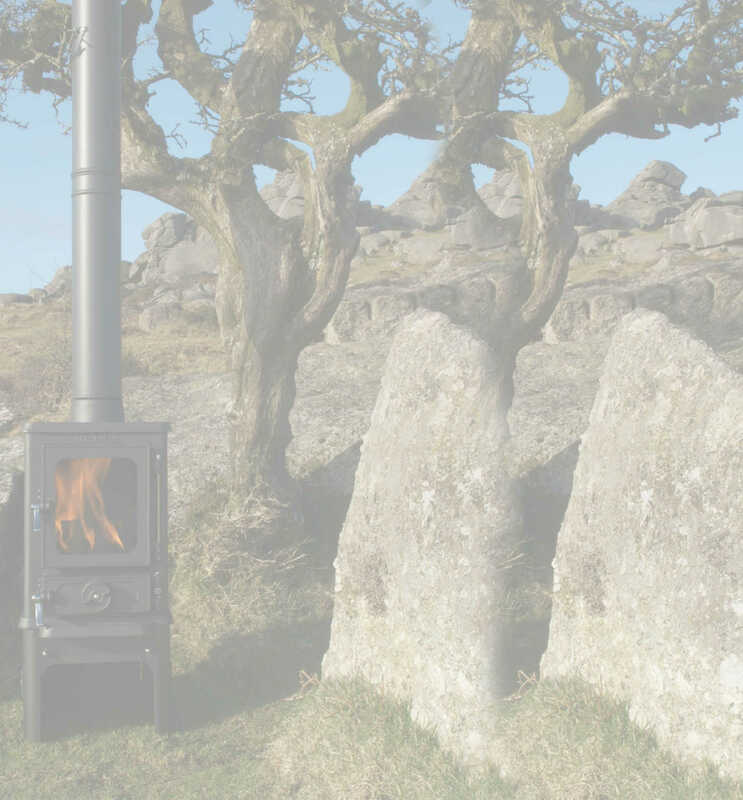 Over the last 8 years of making and advising on the installation of our Hobbit small stoves we have become experienced at designing stoves for small spaces and have brought this knowledge to bear in the design of our mini cookstove range. 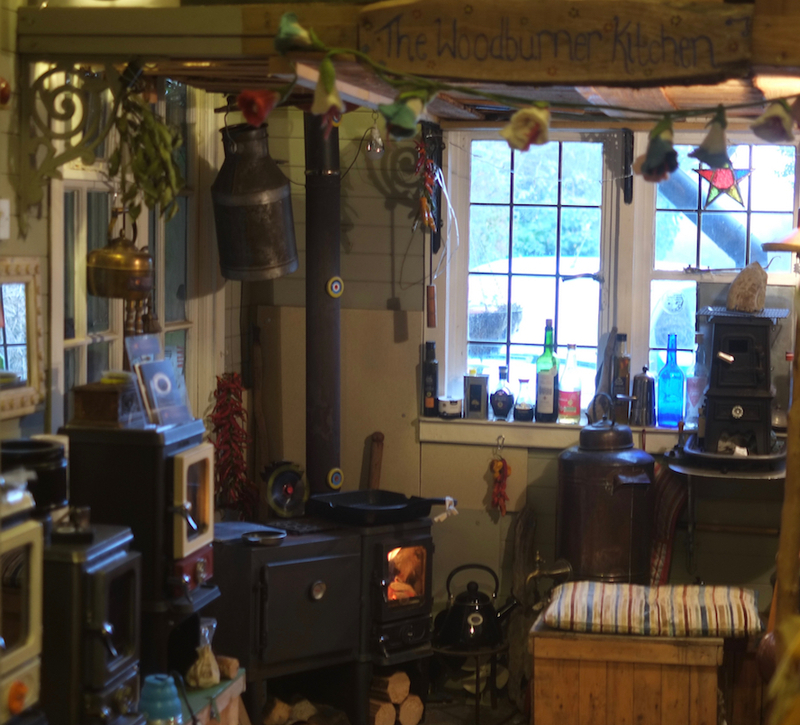 Living lightly off grid requires a wood stove that has much more potential than just heating the space. Our new wood cookstove has the ability to cook up a banquet of food using it’s 880 cubic inches of oven space and 221 square inches of hotplate. But it can also if required produce the entire off-grid hot water requirements for a tiny home or off grid cabin. Utilising the stainless steel back boiler option or side boiler fitted inside your cookstove firebox, the hot water produced can be thermo-syphoned to a special stainless steel chamber to produce hot water on tap. Read more. I made a prototype first to trial it for 18 months and perfect the design. The top of the small cook stove is basically just one big stainless steel cooking hotplate. A stainless steel inset which can be easily removed for cleaning if required and an enamelled black outer also to facilitate easy cleaning. The wide range of cooking temperatures available across the surface of the hotplate makes it very versatile and allows a number of items to be cooked at varying speeds, all at the same time. 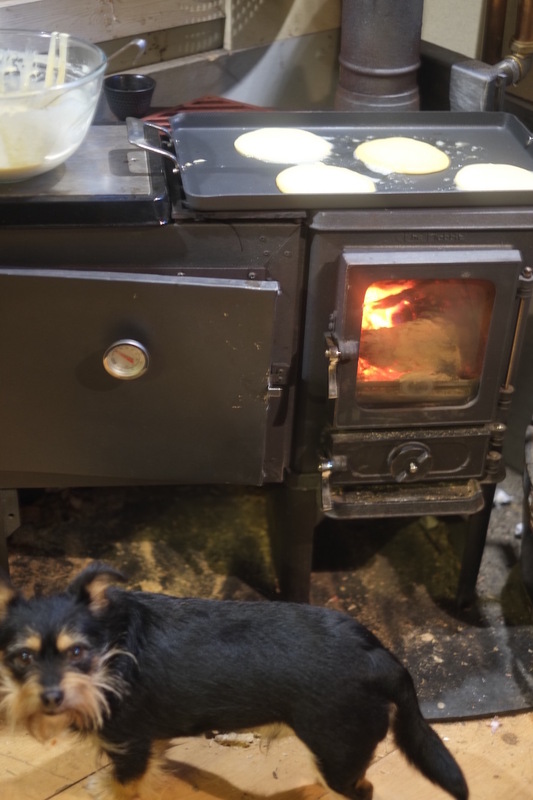 The new mini range is a larger version of our Hobbit stove with a much larger stainless cooking top and with the added advantage of a good sized oven. 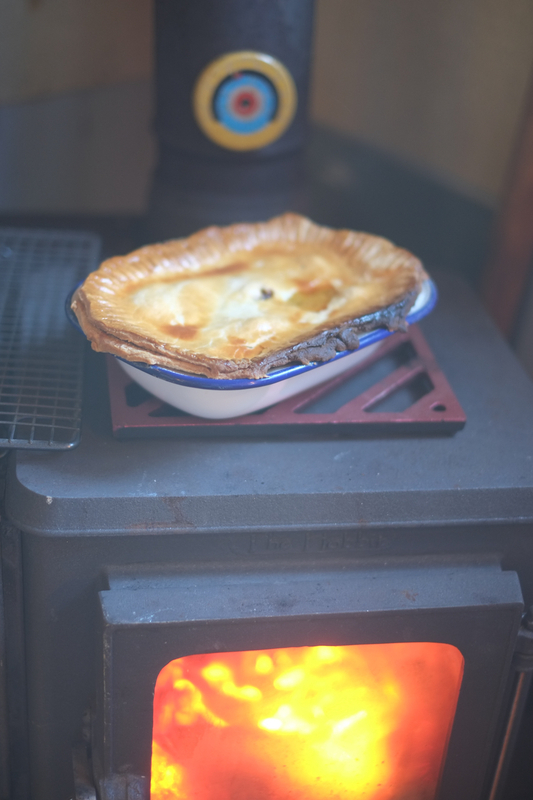 You can see how this will look by taking a peek at the development of this cooking hotplate on the tiny wood stove. The construction will be a combination of heat retentive thermally insulated cast iron body plates along with stainless steel fittings and 316 A grade steel flue chamber. Just like our little stove has become popular as a result of it being a solid, well made product that does a good job (whilst also looking great! 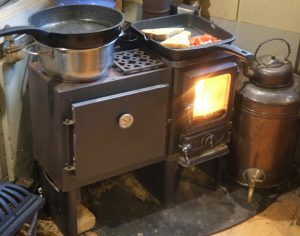 ), we anticipate our new tiny wood cookstove will be a joy to sit next to and use. 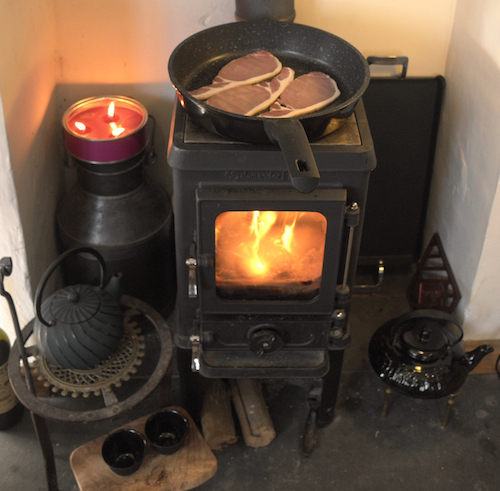 All I can say is that there is little better in day to day life than cooking on wood in your own house, garden room or off grid retreat. 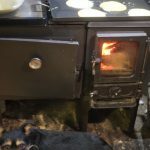 I have enjoyed cooking, baking and toasting on my prototype and you can watch me cooking on my new vimeo channel which I have instigated to showcase the tiny wood stove cooking potential it has to offer. All of these topics will be covered on our video channel as we showcase our new baby! 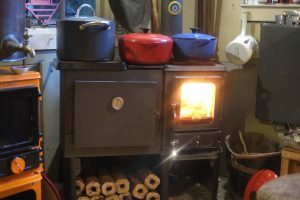 We will show you not only how to cook on our new stove but also how to install your wood cookstove, how to connect it up to configure your hot water system, how to install a direct air hook up. The loaf in the picture was baked in my prototype and is the first recipe that has gone into our small wood cookstove cook book that will be free with every range. 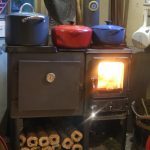 A comprehensive guide on how best to use your small wood cookstove and achieve the best cooking and heating results. 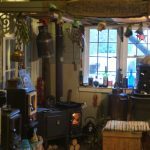 There are recipes, tips and ideas to inspire you to really make the most of your wood cook stove. It has taken 18 months to perfect the new salamander mini cooking range and is a more complex bit of kit than it appears. 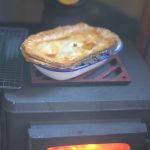 Whilst it is compact in proportions the same as our tiny stove that it is built around, our tiny wood cook stove range has a lot of layers! The image below shows just how many when all of layers of the auto cad are switched on at once. I think this image is a thing of beauty, a real work of art and will have to have the images printed onto canvas and hung on the wall in the lounge! (if Gill would let me). 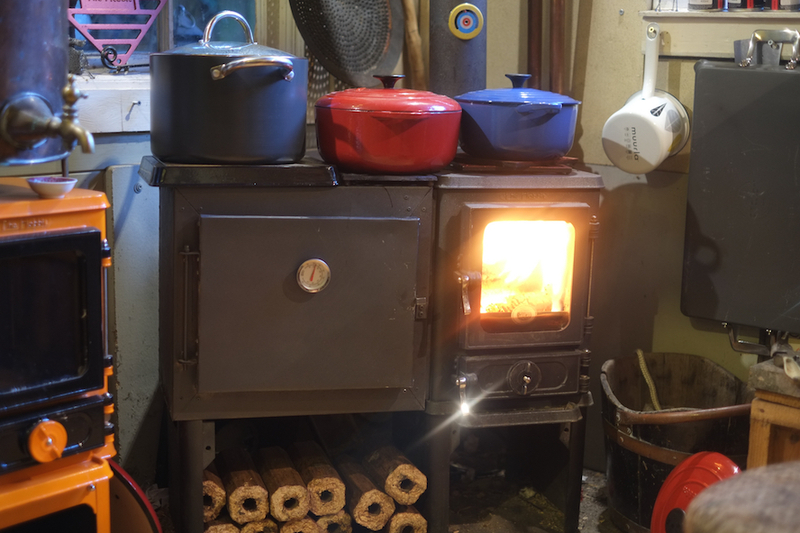 Maybe I will settle for a print on the wall of my office but this would not diminish the great sense of pride and achievement that we both have in designing and making both the Hobbit stoves and now on the shoulders of this little stove, our new Salamander small wood cookstove. The new mini cooking range is an elegant combination of well designed and finished elements. each corner, every radius and union between components having been considered, re-considered and then refined, to make sure every detail is spot on. 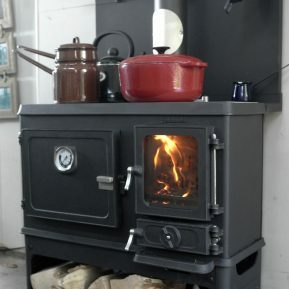 It was our mantra with the design of our tiny wood stove and has remained so in the design of our new small cook stove. Each one comes with a 7 year warranty along with the same excellent 5* customer service. Be one of the first to experience the joy of cooking on a tiny wood cook stove and order yours today. 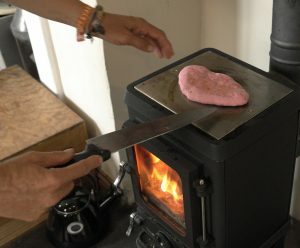 Here are some pictures of me cooking various items on the prototype small wood cookstove. The oven door has an inset oven thermometer with stainless steel trim to compliment the stainless steel fittings and rail option. As you can see I am passionate about cooking on my stove. I have poured every ounce of this passion into the design of our new stove and the first batch of castings will soon be ready to build 20. One for the EN Approval here in the UK and one for EPA certification to take place in the US. Only 18 Early bird specials of our new range will therefore be available in July, so contact us now for more information and reserve yours before they are all gone. 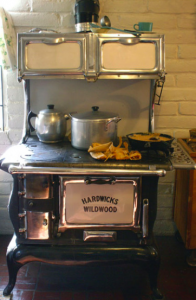 Check out more wood stove cooking information in the TINY WOOD STOVE KITCHEN or some more Wood burner cooking recipes on this Wood burner cooking blog, I made a few years back now. For those that have read our testimonials and are confident in the quality of our products, we are offering an early bird opportunity to save some money.